Next Monday, March 20th MAYA will host a wine dinner with Suertes Del Marques, Spanish Wines. Brought to you by Torres; these newly arrived volcanic Tenerife wines offer their own indigenous grapes. Paired alongside our great Mexican food please come by for a fascinating wine dinner! It will be a four course dinner paired with 4 glasses of wine. 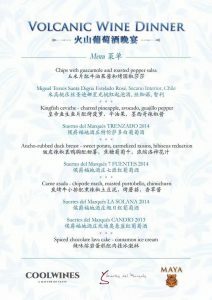 Arrival at 7 and dinner starts at 7:30pm, 458RMB per person. Please call Rob at 13818942747 for reservations. Thank you!